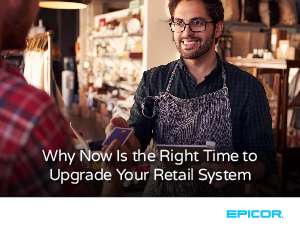 > Epicor > Is Outdated Software Preventing Retail Business Growth? Does your current software give your business the visibility and flexibility you need to be responsive and competitive, or is outdated software negatively impacting business growth and excellent service? The retail world is becoming more complex. eCommerce has grown in the U.S.—from $42 billion to $236 billion in the last decade*—and lifestyle shopping is raising customer expectations. Having the right retail management software solution—one that can keep up with your business needs and the increasing pace of technology—is critical. Given the recent advancements in technology—and higher customer expectations—perhaps it’s time to ask if your retail management software is up to the task of nurturing and managing your growth over the coming decade. View this guide to learn more about how these risks may stifle growth for your retail business and tips on how you can avoid them. Excessive labor costs and hiring gaps- Outdated technology can affect employee retention and productivity when old systems and processes make tasks difficult for your staff. Operational inefficiencies- Manual tasks frustrate workers and limit time for serving customers. Technology should enable you to do more with less and to run your business better overall. Insufficient data and insights- Insufficient data can lead to costly issues, missed opportunities, and unmet customer expectations. To make smarter, faster decisions, you need real-time information at your fingertips-anytime, anywhere. Diminished customer satisfaction- Customers are used to completing tasks easily and intuitively with their mobile devices. Invest in software that helps you deliver an exceptional customer experience and drive loyalty. Disconnected business- Today’s customers and suppliers expect a consistent customer experience across channels-mobile, eCommerce, brick and mortar, etc. Use technology to stay connected and simplify your business. Stagnant business growth- Without the right mobile, eCommerce, and web tools, you can’t do business with your customers when and where they prefer. Make it easy for customers to choose your business. Data security threats- Cyberattacks can cost retailers millions and damage your reputation. Out-of-date security won’t block the latest hacking attempts and viruses, leaving your business vulnerable to threats. System crashes and downtime- POS downtime can cause long lines that may drive shoppers to your competitors can lead to wasted labor costs. View this guide to learn more about how using outdated management software can stifle your retail business growth—and tips on how you can avoid them.